Food and water are not always abundant in the Sahel region. But one thing that is, is sunshine. Caritas has been helping communities in Mentao refugee camp, Burkina Faso, make the most of the region’s scorching heat by providing Malian refugees with solar cookers. They look like upturned satellite dishes but are incredibly useful in an area where gathering firewood can cause deforestation and problems with the local people over the depletion of resources. 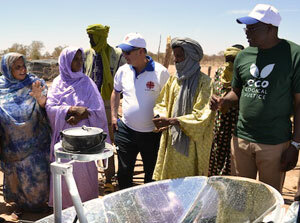 In fact, the solar cookers are much quicker than traditional ways of cooking. Rice, beans and grilled food can be ready in just 30-40 minutes. Another advantage is that the food the refugees prepare no longer tastes of smoke. Thousands of Tuaregs fled to Burkina Faso from Mali in 2012 as a result of war in their homeland. There are currently over 50,000 Malian refugees in the country, living in three main camps plus other places. They live in a very difficult environment, battered by violent winds and extreme heat and where famine and droughts are common. Sixty solar cookers were given out to refugees at the beginning of 2014 thanks to a partnership between Caritas and the United Nations refugee agency (UNHCR). The cookers cost just over US$200 (100,000 FCFA) to produce and last up to ten years. Caritas also helps the Malian refugees in the Mentao camp by providing livestock and animal feed.